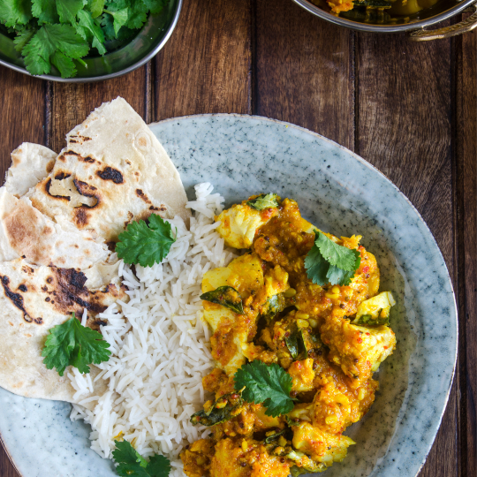 This lightly spiced cod curry is packed with nutrients and flavour. Heat the oil in a large, lidded frying pan. Cook the onion over a high heat for a few mins, then stir in the curry powder, ginger and garlic. Cook for another 1-2 mins until fragrant, then stir in the tomatoes, chickpeas and some seasoning. Cook for 8-10 mins until thickened slightly, then top with the cod. Cover and cook for another 5-10 mins until the fish is cooked through. Scatter over the lemon zest and coriander, then serve with the lemon wedges to squeeze over.